NEW YORK (Reuters) - Kenyan-born American Bernard Lagat plans to seal his legacy with a record eighth victory in the Wanamaker Mile at Friday's 103rd Millrose Games at Madison Square Garden and then shift his focus to longer distances. Lagat is tied at seven wins with Irishman Eamonn Coghlan, who chalked up his victories between 1977 and 1987, at the annual indoor event named after the head of the Wanamaker's Department Store in New York City, Rodman Wanamaker. "When they open that page of the record book and they look at Bernard Lagat winning eight in the same page as those great champions that have run before, that would be very special," he told Reuters in a telephone interview. Employees of the Wanamaker Department store started up a track club that gave birth to the meet and the mile name and every year since 1926 some of the greatest milers in the world have tested themselves on the Garden's board track. 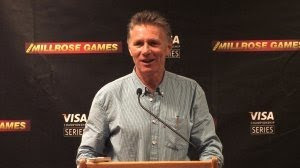 The list of mile winners at the Garden besides 'Chairman of the Boards' Coghlan include his fellow Irishman Marcus O'Sullivan, Kenyan Kip Keino, Noureddine Morceli of Algeria and American Glenn Cunningham, a six times winner in the 1930s. "Somebody somewhere, a little boy somewhere, will see that I did this and would be thinking: 'Bernard did this and I could become one of them'," said Lagat, who has won the last five mile races at the Millrose after victories in 2001 and 2003. "That is the meaning of winning the eighth for me -- leaving a legacy that will inspire others." 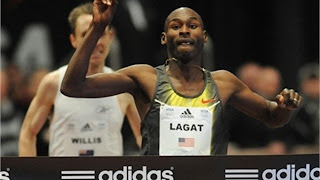 Following the Millrose, which launches the U.S. indoor season, Lagat plans to run the 5,000 meters in Boston and in Birmingham, England to gauge his readiness to contest the 3,000 at the world indoor championships in Doha in March. "I will run 5,000 next week in Boston, testing how good my preparation for the 3,000 is. I would like to win the world championship in Doha and (regain) my 3-K title from way back in 2004. I feel like I can do that." Lagat's greatest triumph was becoming the first man to reign as the 1,500 and 5,000 meters world outdoor champion with his double success in 2007 in Osaka. At the 2009 worlds in Berlin, he won bronze in the 1,500 and silver in the 5,000. "In the future, I would like to move to the longer stuff," said Lagat, adding that he still planned to mix in some 1,500 races to maintain his speed. "For London in 2012, the 5-K is most likely," he said referring to his Olympic ambitions.